Dr. Paul Dowdy from Heritage University gave a workshop on 3.9.2012 about Instructional Strategies for Optimal Knowledge Retention. For those of you who were unable to make the seminar, I hope to relay some of the more important information Dr. Dowdy shared and add a little bit of my own. Learning and retention are two different processes (1). · Learning is the goes-inta process - It involves the brain, the nervous system, and the environment, and the process by which their interplay acquires information and skills. Dr. Dowdy shared that, “we learn through similarities”. My interpretation: when the environment provides us with a stimulus that is new to us, our minds seek similarities that we have in memory to attach them to. It’s just easier that creating a whole new one. · Retention is the goes-outa process – It refers to the process whereby long-term memory preserves learning in such a way that it can locate, identify, and retrieve it accurately in the future. Dr. Dowdy shared that,” we retrieve information from memory through differences”. My interpretation: when the environment provides us with a stimulus we seek from memory related information in an effort to understand it. When designing instruction, learning and retention should be given separate consideration and use different strategies. For learning, Dr. Dowdy shared the Brain Based Compatible strategies for learning from the book: Classroom Instruction that Works, by Marzano, Pickering & Pollock (2). · Feeling Tone – a welcoming attitude in classroom. When students feel safe they remember more. (Refer to my post on motivation). · Transfer – Transferring information from a previous lesson to a new lesson. · Meaning – When a lesson is meaningful, students remember the information. · Modeling – When students watch you model what you expect them to learn or the process, they are able to remember the information. · Original learning – When students are able to understand, the first time they see new material, they are able to remember that material. 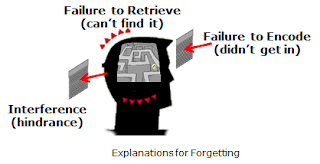 Forgetting is a mental state when one ceases to or fails to remember; unable to recall. Marcy Driscoll in, Psychology of Learning for Instruction (3), suggests three explanations for forgetting. · Impediment: other events or information get in the way. · The appropriate teaching strategies do enhance the amount of retention. · The ability to recall information accurately (retention) will decrease with over time unless it is periodically utilized. You might have been exposed to (with legitimacy) about the “Learning Pyramid” indicating the average student (whatever that is?) will retain 5% of a lecture, 10 of what is read… 90% of what we teach others. This information has been used to advance the idea of “Active Learning” and various agendas about instructional design. “Now the rest of the story”: Since it is a rate, it is missing half of the units. 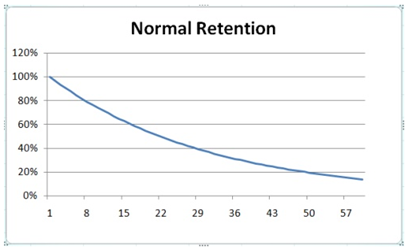 The retention happens over some period of time. So we (OK at least I) have been led to believe it is indefinite since no time period is given. The only complete information (based on research) I have found on the affect of method on retention is by Moore (4) which specifies a time of 24 hours. So what happens after that? The first 24 hours is part of the typical “Forgetting Curve”. Retention decreases over time unless rehearsal or recall takes place. Further, how the information on the pyramid is shown is misleading. Being at the bottom are doing and teaching; this suggesting this is the base. The base should be inverted since the strategies are an additive process. You cannot teach others about something without learning about via: lecture, reading, audiovisual…. In addition, all of the strategies are not practical for certain types of learning outcomes. For example: when learning first aid, you do not have to have a heart attack (doing) to remember the symptoms. 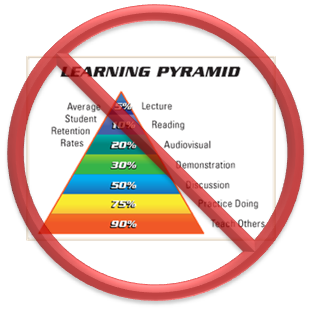 · Don’t take the “learning pyramid” at face value. · Appropriate teaching strategies do enhance the amount of retention because the strategy directly affects the strength of the memory. The stronger the initial memory strength the longer the memory will be retained. · The ability to recall information accurately (retention) will decrease with over time unless it is periodically utilized. It is true! If you don’t use it you lose it. · Spacing learning events over time to cause memory recall is the most effective tactic for long term retention. Note: not helpful at all for short-term memory. In the realm of instructional design we don’t have much influence on what happens prior to or after instruction, therefore the best we can do is to provide our students with the strongest memories possible while we do have influence. How? · Elaborative: Paraphrasing, selecting and note taking, predicting, questioning, summarizing. Length of teaching session (Prime Time (1)) Dr. Dowdy recommended for a one hour session, the first 20 minutes in learning the rest of the hour in rehearsal. Check (think formative evaluation) & remediate as necessary. Avoid teaching similar skills at the same time. For long term memory less is better! The rest is up to the learner and his or her work environment. Write a comment and share how you would implement one of the retention tactics shared by Dr. Dowdy. 1. Sousa, D. A. (2006). How the Brain Learns. Third Edition. Corwin Press. Thousands Oakes, California. 4. Moore, K. D. (2005). Effective Instructional Strategies: From theory to practice. Thousand Oaks, Ca. Sage Publications. 5. Jonassen, D. H., Grabinger, R. S. and Harris, N. D. C. (1990), Analyzing and Selecting Instructional Strategies and Tactics. Perf. Improvement Qrtly, Vol-4, ppg 77-97. 6. Encoding Specificity Principle – whatever cues are used by the learner to facilitate encoding will also serve as the best retrieval cues for that information.